Good quality insulation helps keep the heat in during winter and out during summer. This makes your house easier and cheaper to heat properly, and more comfortable and healthy to live in. The priority for insulating your home should be ceiling followed by underfloor and walls. Correctly installed insulation can save you money on your heating costs – up to $400 per year by using 50% less energy to heat your home. Ceiling insulation is generally the easiest, cheapest and most effective insulation to install in your home. It’s a great place to start making your home warm, comfortable and healthy to live in. Hot air rises, so for most homes making them easier and cheaper to heat properly starts with good ceiling insulation. Fortunately, ceiling insulation is relatively easy to install in houses with accessible roof spaces. Air Con New Zealand uses Knauf Earthwool Glasswool insulation to provide the best quality insulation for your home. Earthwool glasswool is rot-proof, odourless, non-hygroscopic, does not sustain vermin and will not encourage the growth of fungi, mould or bacteria. It is chemically neutral, does not contain impurities and comes with a 50 year warranty. 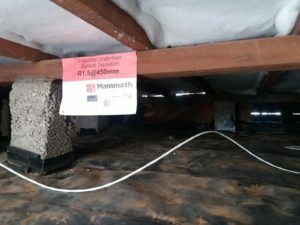 Underfloor insulation is one of the first things to consider in most existing houses to make them warmer, healthier and more comfortable – and in homes, with accessible underfloor spaces, it is relatively cheap and easy to do. Air Con New Zealand uses Mammoth underfloor insulation. Made from 100% polyester fibres, Mammoth insulation does not deteriorate with moisture resistant and unlike polystyrene insulation won’t affect electrical wiring. Wall insulation is not easy to check or install, but it makes a big difference to the comfort and warmth of your home. 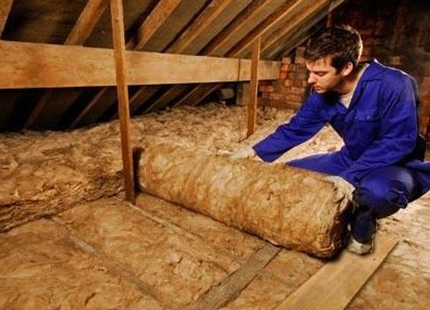 Once you have insulated your ceiling and underfloor, installing wall insulation is the next most effective step for reducing heat loss in your home. It is difficult to check and install wall insulation in existing houses without taking the lining or cladding off, so take the opportunity to do it if you are renovating. There are funding and assistance to insulate your home through some local council throughout New Zealand. Check out our page specifically about these types of assistance.